I will mention some experiences which I think will recall memories to older residents of McPherson County. 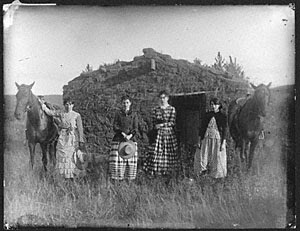 Among the Nebraska pioneers were Will and May Hanna who came from Ohio with their two little girls, Irma and Alberta, early in 1904. A third girl, Ernestine, joined the family in November. On October 19, 1906, a heavy snow driven by high winds swept over the sandhills. The Hanna family was not prepared for such unseasonable weather. Will had gone several miles to move some cattle. May and the three little girls were alone in the little soddy. May took the precaution to put the axe and a shovel indoors. In the morning snow covered the front of the house completely, but she was able to shovel her way out. She was unable to find sufficient fuel in the deep snow, so she used the axe to break up a chair and some leaves from the table to replenish the fire. In the summer of 1907 May Hanna was seriously ill from rheumatic fever. After being cared for at home for a time, she was taken to a small “Hospital” in Tryon (Maybe in a private home.). Dr. Morris was the attending physician. After several weeks she recovered and was able to return home. She mentioned a Mrs. Jividen who cared for her in Tryon. Prairie Fires were a dreaded menace. The most disastrous one swept in on a terrific wind just before night in March of 1910. Sparks set fire to the hay around the barn before the head fire was near. Will rushed into the burning barn to save his horses, but they were terrified by flames near the door, so he could not lead them out. Jerking off his denim jacket he wrapped it around each horse’s head as a blindfold until he got them to safety. Irma remembered a small calf and got it out of the burning barn. Fire spread quickly to other buildings. One hog perished and others escaped with painful burns. The hay roof on the chicken house fell as a flaming blanket, destroying many chickens. Three large stacks of rye were waiting for a threshing machine and they were also destroyed. The fire burned over the house where the two younger girls crouched in terror; but as it was sod with sod on the roof over the tar-paper, it did not ignite. What a scene of devastation it was when daylight returned. The girls set to work picking the buckles from the burned up harness where the barn had been. Even buckles must be saved in those days. Their sorrow was great when they found the charred bodies of their two coyote hounds where they had perished (probably from smoke) in the hay-filled manger. With true pioneer grit, the Hanna family replaced their buildings as promptly as possible. Lumber for the new barn had to be hauled many miles over poor roads with horses and a wagon. 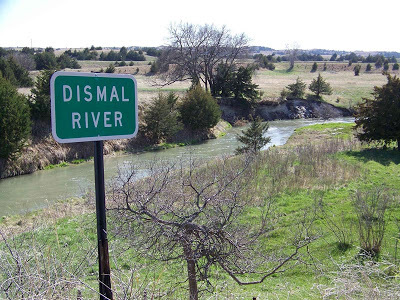 Each summer the family enjoyed at least one picnic on the Dismal River. These were never-to-be-forgotten days looked forward to weeks in advance. Who cared that they always got into nettles and poison ivy, that skin and clothing were torn by heavy brush, or even that the river was swift and treacherous. Photo of the Dismal River from a blog recording hydrologic oddities. It's a fascinating read about the steadfastness of the stream. A post office was established in McPherson County at the Sol Cloud home about 1907. It was named Ney. Ernest Ensign, my grandfather, was the first mail carrier. Ed Wentz was another of the early carriers. In March, 1913, a raging blizzard swept the Sandhill region, causing much loss of stock to some people. It was impossible to face it, even for a short time. The fine snow sifted in through windows and eaves, later melting and dripping from the ceiling. Will expected most of his livestock to perish, as it was impossible for him to reach them. But rugged bronco horses knew how to survive. In places they had kept trampling the snow until it resembled a room with walls. Not one of his perished. The fury of the storm abated in about 24 hours, but huge drifts lasted for weeks. We are proud of our county and state as it is today; but let us honor the rugged men, women and horses who endured the early day hardships; and paved the way for a more progressive, convenient way of life in the Nebraska Sandhills.